Amanda Aizpuriete is a Latvian poet, novelist, essayist and translator. Born in Jurmala in 1956, she studied philosophy and philology at the Latvian State University, Riga, and at the Maxim Gorky Literary Institute, Moscow. Her many poetry collections include: Nāks dārzā māte [Mother will come into the garden], 1980; Nākamais autobuss [The next bus], 1990; Bābeles nomalē [In the Suburbs of Babel], 1999;Viršu debesī [In heather heaven] 2003 and Sena tikšanās vieta [Ancient meeting place], 2008. She has also published a novel and many essays, and edited an anthology of Latvian poets. 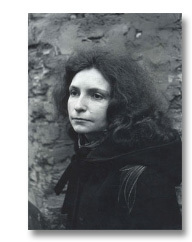 She has translated Ken Kesey’s One Flew Over the Cuckoo’s Nest, Franz Kafka’s The Trial, John Updike’s The Witches of Eastwick, Virginia Woolf’s Orlando, and poems by, among others: Anna Ahmatova, Josef Brodsky, Uwe Kolbe and Georg Trakl. Amanda Aizpuriete has been poetry editor for the journal Avots [Wellspring] and co-editor of the newspaper Aspazija, the magazine Karogs [Flag], and Vides Vestis [The Herald]. She has received the Horst Bienek Prize, Bavaria, 1999; the Latvian Days of Poetry Award, 2000, for Bābeles nomalē; and the 2003 annual best literary translation prize for her version of Akhmatova.